Saturday, February 3, 2018, 5:00 p.m. – 6:00 p.m.
There’s a video that’s made the rounds on YouTube for years, Leonard Bernstein not conducting the Vienna Philharmonic in the Finale of the Haydn Symphony No. 88. That's correct, not conducting: It’s an encore, and as the applause dies away, he starts the music, then drops his hands to his side. For the rest of the movement he smiles, nods, purses his lips, raises his eyebrows, looks up, looks down, looks sideways, but does nothing that we would call "conducting." The performance is crystalline. It almost seems like a joke, as if Bernstein were saying, "I know what you think of my jumping and gyrating and gesticulating on the podium. But I don’t need to do that. Watch this and find out what I’m all about." Leonard Bernstein, whose 100th anniversary is being celebrated throughout the world all year long, was indeed known for his athletic style of conducting. 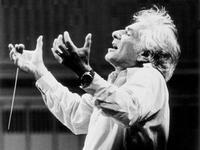 If there is a "less is more" philosophy, put Bernstein under the worldview of "more is more." "More" describes Leonard Bernstein better than any other word, since we hardly have time on this Discoveries from the Fleisher Collection to do more than list the accomplishments of perhaps the greatest musician America has yet produced. Bernstein was a conductor, composer, and pianist; he was an educator of audiences and creator of new audiences; he was a lion of the repertoire, a cheerleader for his fellow composers, and a discoverer of new talent. And he was more. It is easy to forget that Gustav Mahler owes his standing in the orchestral firmament in no small part to Bernstein’s recordings. He recorded the symphony cycle, basically, three times, in the '60s, '80s, and in a televised project from the '70s that was remastered and released. Mahler certainly wasn’t unknown. Bruno Walter—whom Bernstein stood in for at the New York Philharmonic, without rehearsal, in 1943—was a champion of Mahler. But Bernstein’s insistent engagement with Mahler lifted the Austrian’s status to where it is around the world today. Bernstein was the New York Philharmonic’s Assistant Conductor, under Artur Rodzinski, when he filled in for ailing Guest Conductor, Walter. His success that day brought him instant fame and an international guest-conducting career. He became known for adventuresome programming, such as premiering the Olivier Messiaen Turangalila-Symphonie in Boston in 1949 and the Charles Ives Second Symphony in 1951—a half-century after its creation—with the Philharmonic. Finally, the Philharmonic invited Bernstein to become its Music Director in 1958, and he brought out the Ned Rorem Symphony No. 3. As big of an impact he had during his Philharmonic years, with his decades of guest-conducting and powerfully inventive recordings, his voice as an American composer may be just as great—and as varied. He wrote three symphonies and many other orchestral pieces, choral and chamber works, songs and piano music, operas and ballets. On the Waterfront, a straight film score, is not adapted from anything else. His most explosive work may be the most unusual, however, especially for a "classical" musician—the musical West Side Story, which is a stunning brick-and-fire-escape retelling of Romeo and Juliet that has never gotten old since its creation in 1957. It is filled with heart-on-the-sleeve tunes, blatant pop riffs, cheekiness, a mambo... and sublimity. In it, Leonard Bernstein cries out in anguish for two people—for two peoples, for all peoples—to hold onto each other. The musicians are looking at him, and they are smiling, during the performance, and after. He is sweating (yes, it is the end of a concert, but that’s new sweat coming down his forehead even as he stands there). And finally, note the bow. He takes no solo bow, but he grabs the hand of the concertmaster and the principal cello. Here, he seems to be saying: I know what you’re thinking, but this is what I’m all about, this is what I do. He holds onto them and does not let go. 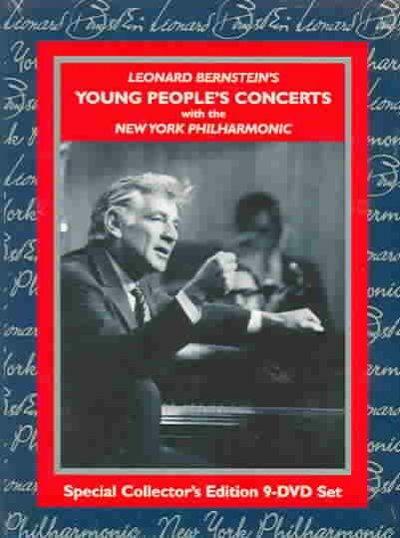 Leonard Bernstein's Young People's Concerts with the New York Philharmonic,originally televised between 1958-1972 and released as a dvd compilation in 1990.